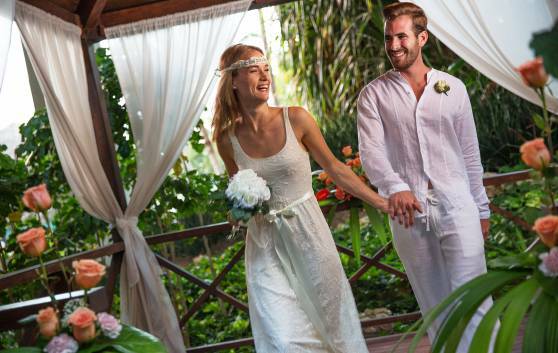 Wedding and Honeymoon programs at Sol Cayo Largo hotel. The 4-star All-Inclusive Sol Cayo Largo hotel invites couples to enjoy the singular beauty of the surrounding pristine beaches fringed by coconut palm trees and one of the most beautiful coral reefs in the Caribbean destination. Sol Cayo Largo hotel has designed spectacular Free Wedding, Weddings a la Carte, Renewal of Vows and Free Honeymoon programs, with minimum requirements according to the market in this tropical paradise. Ideal for couples who prefer a more intimate setting and to personally choose from a menu of services with excellent added values. Couples can enjoy special honeymoon packages in this paradise. Recorded music of your choice. Wedding breakfast in the room.